Sunday, September 23, marked the 20th anniversary of the first woman to play in any of the major professional North American sports leagues. It happened during an NHL exhibition game when the St. Louis Blues faced the Tampa Bay Lightning. Manon Rheaume, a French-Canadian, who spoke little English at the time, may have started out as a publicity stunt for the expansion team, but it didn’t take long for many of her teammates or for the members of the Blues to take her seriously. 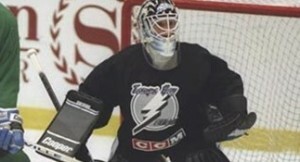 While her time in the NHL may have been short-lived, Rheaume handled the pressure of playing in an NHL game along with the constant hounding of the media with the grace and guts that it takes to be a good goaltender. Rheaume never played in another NHL game after that. At 5’3, she may not have had the size that most NHL goalies had, but she had the skill that was comparable to others in her profession. Her former coach Terry Crisp thought it was a joke when GM Phil Esposito brought her into camp, but Crisp said of the six goaltenders he had in camp that season, she was probably third best on the depth chart. Rheaume now lives in northern Michigan and watches her two sons play hockey. By the way, the Blues ended up winning that game 7-5.